First you should know the breakout board is 3.3V logic level and it can not connect for Arduino 5V Board directly. 1: Do not plug USB cable and supply external 3.3V power for the 5V pin on for Arduino board, so that it works at 3.3V logic level. 2: Use some 3.3V MCU development board, such as OPEN-SMART UNO R3 that has a 5V/3.3V switch to select 5V or 3.3V logic level. – 4 wire SPI digital interface – SDA, SCK, CS and DC pins. 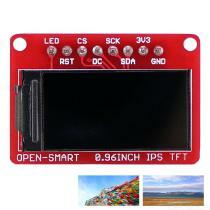 – LED pin can connect to external backlight control circuit to control the brightness of backlight. You can connect it to GND to turn on the backlight all day.